As my ASCE presidency draws to a close, it’s time to look back and reflect upon what we have accomplished together this year. While an important role of the Society president is to focus externally on our strategic priorities, I’ve also kept my focus this year on how to advance ASCE as an organization by clearly understanding how we can work more effectively together to be fully prepared for the future. Developing our leaders is key to our continued success. Over the last two years, I’ve talked with members and other organizations about what we as a leadership team are doing to make a difference. I noted that with the Board Committee reorganization, we’re encouraging closer collaboration with the Institutes and promoting far greater dialogue with the Board of Direction. 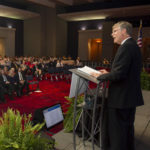 And, like the committees, the Board itself is evolving; it’s moving beyond a policy-based charge to becoming a strategic board advancing us and the profession toward a future inspired by Vision 2025. This year, the Board has taken responsibility for driving the strategic direction of ASCE. We’re also expanding leadership training at all levels. As members progress along the leadership continuum, they are offered more advanced training. It begins with the annual Multi-Region Leadership Conferences (MRLCs) which are continuing to evolve to provide more in-depth training to grow our future leaders and help them develop in their professional careers. We’ve added thought provoking presentations by Industry Leaders Council (ILC) members on “What is a leader?” as well as sessions covering ethics, best practices, public speaking and leading others. The 2014 MRLCs provided our up-and-coming member leaders with the opportunity to practice what they learned in a safe, non-career impacting environment. Similarly, every fall we hold orientation for our more senior Society leaders as well. In addition to the Presidents and Governors Forum, incoming Board members, the President-elect, and Committee chairs are brought together for a weekend of intensive training. Like the leadership training provided at the MRLC’s, the knowledge these Society leaders develop improves their leadership skills within ASCE and benefits them in their careers. And especially noteworthy is the change in leadership at ASCE headquarters. Pat Natale, who guided our Society as a leading voice for Civil Engineering and ASCE as well as greater unity across the engineering profession will be retiring as Executive Director this year. We are also fortunate that our current deputy executive director, Tom Smith, will become our new executive director. Tom is the perfect example of the value of growing our leaders within the ranks. I want to thank Greg DiLoreto for his support and advice and I wish Bob Stevens success as he takes over the helm as president of ASCE. 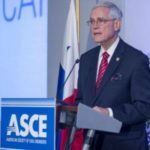 I’m proud that ASCE will continue to grow and expand, particularly as we pursue our global strategy under his leadership. I also want to thank you, the members, for your generous support this year and the countless hours of volunteer service you provide to advance this Society and our profession. As I say farewell, please know there is no higher professional honor than being president of the American Society of Civil Engineers. I’ve been touched both personally and professionally in so many ways by the experience. It’s reinforced my hope for a successful future for ASCE and our profession.